This noninvasive technique may provide new treatments for diseases ranging from cancer to macular degeneration. Neovascularization and vascularization play a critical role in the pathogenesis of numerous pathological conditions, including cancer, inflammation and retinal vascular diseases. Retinal diseases such as macular degeneration and diabetic retinopathy are leading causes of blindness. Therefore, significant research efforts have focused on the development of antivascular therapies, which include anti-angiogenic and vascular targeting therapies. Figure 1. The photomediated ultrasound therapy (PUT) system consists of a laser system and a therapeutic ultrasound system. The generated bursts are amplified by a 50-dB radio frequency amplifier before being sent to the therapeutic ultrasound transducer. Either an optical microscope or a PeriCam PSI System is employed for real-time monitoring of microcirculation (a, b). Each laser pulse is delivered to the sample to overlay the beginning phase of each ultrasound burst (c). Photograph of the system (d). Courtesy of the Authors. A noninvasive antivascular therapy called photomediated ultrasound therapy (PUT) has been developed and was reported this year in Scientific Reports1. 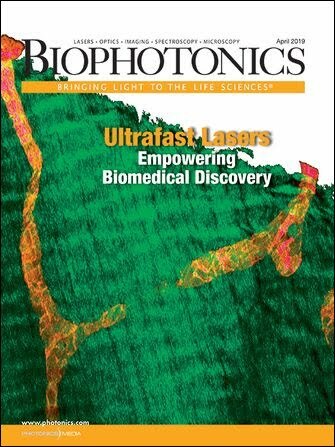 PUT synergistically applies nanosecond duration laser pulses and ultrasound bursts on target tissue, offering high-precision localized treatment of micro-vessels. PUT is a hybrid ultrasound and optical technique that can selectively treat microvasculature. The acute antivascular effects have been demonstrated on chicken yolk sac membranes and rabbit ears. The technique has potential as a tool for noninvasive, agent-free, highly selective and highly controllable treatment of microvessels. Cavitation plays a major role in photo-mechanical ablation. PUT is based on well-controlled induction and promotion of microcavitation activity in the target vessels. When a laser pulse is absorbed by hemoglobin, the tissue is excited and the photoacoustic effect occurs. The synergistic application of ultrasound significantly increases the likelihood of microcavitation in the blood vessel. The produced cavitation then can be further enhanced and driven by the subsequent ultrasound pulses. Figure 2. An embryo development day-three chicken yolk sac membrane. A.V.V. : anterior vitelline vein, L.V.V. : lateral vitelline vein, P.V.V. : posterior vitelline vein, VA: vitelline artery. Courtesy of the Authors. The shear stresses and microjets produced by oscillating cavitation bubbles in a microvessel can directly impact the physiological functions of vascular endothelial cells, red blood cells and platelets. This results in vasocontraction, blood clot formation and hemorrhage. The mechanism is somewhat similar to that of photodyanamic therapy (PDT) and antivascular ultrasound therapy (AVUT), where microvessels also are destroyed by triggering the physiological functions of endothelial cells, red blood cells and platelets (see sidebar). However, unlike PDT and AVUT, which involve the injection of either photosensitizers or microbubbles, PUT is noninvasive and agent free. Additionally, the laser energy level needed by PUT is very low (as low as 4 mJ/cm2, which is under the safety limit set by American National Standards Institute [ANSI] for skin and eye exposure). In comparison, laser pulse energy used by photothermolysis, another noninvasive antivascular technique, is generally larger than 1 J/cm2. As a result, PUT can offer deep penetration and unprecedented high precision for treating microvessels beyond the skin surface. The advantages of PUT, which is facilitated by the synergy of light and sound, could be enormously significant when translating the technique to patients. Figure 3. The vein on a chicken yolk sac membrane before treatment with PUT (a). The vein after being treated by PUT with 0.45 MPa ultrasound and 4 mJ/cm2 laser fluence at 532 nm (b). The black circle corresponds to the region of treatment. Change in blood vessel diameter after laser only, ultrasound only, and PUT at 2, 4 and 6 mJ/cm2 fluence (c). Vertical bars demonstrate standard deviation. The relative change of the vessel size shows that statistical significances exist between 4 and 6 mJ/cm2 PUT and any other group (d). Higher laser fluence can result in vessel rupture (e,f,g). Repeated 10 times for each group. *p < 0.05; **p < 0.01, ***p < 0.001. Scale bar: 200 µm. Courtesy of the Authors. In the PUT system (Figure 1), a laser pulse (5-ns pulse width with 10-Hz repetition rate) at 532-nm wavelength irradiated the target blood vessel synergistically with an ultrasound tone burst (1 MHz, 10 percent duty cycle, and 10-Hz repetition rate). The applied ultrasound burst had a negative peak pressure of 0.45 MPa, and the laser fluence varied from 2 mJ/cm2 to 8 mJ/cm2. The treatment duration was either four minutes or until the target blood vessel was disrupted, whichever occurred first. The posterior vitelline (p.v.) veins in chicken yolk sac membranes were selected as the target blood vessels (Figure 2) because they have a relatively uniform vessel size (150 to 200 µm) and have rare branches or adjacent vessels. A rabbit ear blood vessel in vivo model also was evaluated. Figure 4. The vein and artery on a chicken yolk sac membrane before (a) and after (b) being selectively treated by PUT with 0.25 MPa ultrasound and 35 mJ/cm2 laser fluence at 578 nm. The black circle corresponds to the region of treatment. Change of the vessel size was statistically significant with PUT 35 and 40 mJ/cm2 laser fluence (repeated 10 times for each group) (c). Vertical bars demonstrate the standard deviation. A vein and artery before (d) and after (e) being selectively treated by PUT with 0.45 MPa and 12 mJ/cm2 laser fluence at 650 nm. Number of vessels responding to treatment (f). Black arrows indicate the direction of blood flow. **p < 0.01; ***p < 0.001. Scale bar: 200 µm. Courtesy of the Authors. The PUT treatment induced a significant reduction in the diameter of the p.v. veins of the chick embryo model in vivo (Figure 3). PUT also selectively treated arteries or veins based on the difference in optical absorption spectrum between oxygenated and deoxygenated hemoglobin in the visible to near-infrared spectral range (Figure 4). In addition, PUT shut down small vessels on a rabbit ear in vivo model (Figure 5). As shown by the histology (hematoxylin and eosin stain) photos, there were fibrin clots inside the treated vessels while the surrounding cells outside the blood vessel were not damaged. Figure 5. Examples of the blood perfusion maps measured by a PeriCam PSI System before (a) and after (b) PUT on a rabbit ear. The perfusion map clearly demonstrated diminished blood flow in the treated microvessels (white arrows) after the treatment. Scale bar: 1000 µm. Average blood perfusion rate in the target microvessels before and after PUT treatment in 5 rabbits (**p < 0.001, ***p < 0.0001) (c). Hematoxylin and eosin (H&E) stain image of normal rabbit ear tissue without PUT treatment (scale bar: 50 µm) (d). H&E stain images of rabbit ear tissue immediately after (e) and 7 days after (f) PUT treatment (scale bar: 50 µm), respectively. The formation of fibrin clot (black arrow) within the vein lumen is noted, while the surrounding cells are not damaged. Courtesy of the Authors. The findings demonstrate that PUT can selectively treat veins and arteries, and microvessels beyond the surface of optically scattering tissues as well. It’s expected that the treatment depth of PUT would be comparable to PDT and would be deeper than conventional laser ablation, since neither PDT nor PUT relies on photothermal effect as in laser ablation. Most of the conditions that can be treated by PDT, including port-wine stain, cancer, eye neovascularization and central serous chorioretinopathy, could potentially benefit from the development and application of PUT. Haonan Zhang is a Ph.D. student at the Institute of Acoustics, School of Physics Science and Engineering at Tongji University in China, as well as a joint student in the Department of Biomedical Engineering at the University of Michigan; email:haonan48@163.com. Xinyi Xie is a visiting scholar in the Department of Biomedical Engineering at the University of Michigan; email: xinyixie@umich.edu. Xueding Wang, Ph.D., is a professor at the Institute of Acoustics, School of Physics Science and Engineering at Tongji University in China and an associate professor in the Department of Biomedical Engineering and the Department of Radiology at the University of Michigan; email:xdwang@umich.edu. Xinmai Yang, Ph.D., in as an associate professor at the Bioengineering Research Center and the Department of Mechanical Engineering at the University of Kansas; email:xmyang@ku.edu. Yannis M. Paulus, M.D., is an assistant professor in the Department of Ophthalmology and Visual Sciences and the Department of Biomedical Engineering at the University of Michigan; email: ypaulus@med.umich.edu. 1. Z. Hu et al. (2017). High-precision, non-invasive anti-microvascular approach via concurrent ultrasound and laser irradiation. Sci Rep, Vol. 7, Article 40243. doi:10.1038/srep40243. Antivascular therapies currently include anti-angiogenic and vascular targeting therapies. Anti-angiogenic therapy aims at inhibiting the growth of new vessels. For example, angiogenesis inhibitors that target the vascular endothelial growth factor (VEGF) signaling pathway have been developed to treat tumors and eye diseases. While these treatments have been proven to be efficacious, like other pharmaceutical approaches, the systemic administration of drugs can cause serious side effects including stroke and heart attack. Moreover, several studies on cancer have shown that while there is an initial antitumor effect, relapse and progressive tumor growth often follows the use of angiogenesis inhibitors. Local administration of these pharmaceuticals (e.g., intravitreal injection) also carries local risks, including local eye infection (endophthalmitis), cataract, and retinal tears or detachment. Vascular targeting therapy is designed to selectively destroy existing vessels. Several antivascular approaches have been developed, including photodynamic therapy (PDT), embolotherapy, antivascular ultrasound therapy (AVUT) and photothermolysis. These approaches shut down or destroy existing blood vessels. Each has limitations affecting utility. All three vascular-selective methods are invasive. PDT requires the systemic injection of photosensitizers, making the skin and eyes sensitive to light after the treatment. The technique also may cause burns, swelling, pain and scarring in nearby healthy tissue if it extravasates during intravenous injection. PDT in eye applications also has been associated with choroidal infarction and acute, severe vision loss. Embolotherapy is an invasive procedure involving inserting a catheter through the vascular system to the origin of the vessel to be occluded, and then injecting an agent. This is performed to control bleeding, close fistulae or arteriovenous malformations, devascularize organs, and reduce tumors or varicoceles. Embolotherapy carries a risk of emboli reaching healthy tissue, potentially causing gastric, stomach or duodenal ulcers. Antivascular ultrasound therapy (AVUT) is capable of removing microvessels in murine tumors with the assistance of microbubbles. Similar to PDT and embolotherapy, AVUT requires the systemic injection of foreign particles (bubbles) into the blood stream, which leads to serious concerns of toxicity, efficiency and emboli formation. In addition, a very strict treatment time window is a major concern in busy clinics for both PDT and AVUT because the circulation time of photosensitizers and microbubbles is limited. Photothermolysis is a selective therapeutic technique based on optical absorption to remove tissue. It does not necessarily target vasculature. By using milli- or microsecond laser pulses with high laser energy, photothermolysis can remove targets that are highly optically absorptive such as pigmented structures and cells, but it is limited to superficial layers because of its reliance on thermal effects. Beijing Golden Way Scientific Co. Ltd.